Road, rail and air travellers are battling treacherous conditions caused by snow and ice across the UK. Motoring organisations warned drivers to beware after gridlocked roads caused long delays across the country. AA Roadwatch said breakdown teams had dealt with twice as many incidents as normal on Thursday. The weather also prompted about 4,100 schools to close across the country, giving several hundred thousand children a day off. Almost 500 schools in Scotland closed, affecting 103,000 pupils. In some counties all schools were closed. 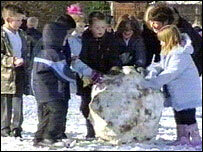 In the West Midlands, at least 1,030 schools closed, including 470 in Birmingham. In southern England more than 200 schools closed for the day in Hertfordshire and more than 100 in Essex, with a further 120 shut in Kent. 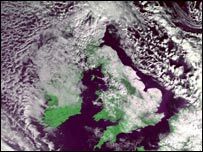 A small number of schools closed in central London and Wales, but none in Northern Ireland where no snow was reported. Several train services were hit, and airports reported continuing cancellations. British Airways cancelled 88 flights at Heathrow while 200 were cancelled on Wednesday. A spokeswoman said there would be "significant delays and cancellations" due to ice and snow at Heathrow and Gatwick. Stansted, Luton and Birmingham airports were also hit. And passengers were advised to check for cancellations before travelling. The Highways Agency said gritters had been out all night on motorways and main roads in England. A spokeswoman added: "All our routes are open - but traffic is very heavy. "Drivers really need to make an assessment whether they need to make a journey and if they do, they need to be really, really careful." An AA Roadwatch spokesman said: "We are advising against all but the most essential journeys and also telling drivers to be extra careful. "There are icy road conditions throughout Britain, with the worst snow in Scotland and the worst ice in the Midlands. "There have been a number of accidents on major roads and some roads are blocked." 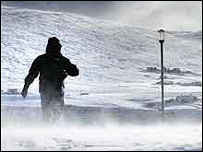 Before then there is a chance of further snow in Scotland, which has seen falls up to 25 centimetres (9.5 inches) deep and drifting caused by high winds. A spokeswoman for the AA in Scotland said: "We are handling a call every second, it's twice as busy as it usually is at this time of year." "A partial thaw was followed by a drop in temperature"